Lieutenant Commander Collins is the son of Neal and Dee Collins of New Albany, Indiana. He enlisted in the United States Navy as a Seaman on 23 June 1971, in Louisville, Kentucky, and attended recruit training in Orlando, Florida. His first duty station was Dam Neck, Virginia where he attended Poseidon Electronics Class “A” and “C” schools. Upon graduation in September 1972 as an Electronics Technician, Petty Officer Third Class, he was transferred to Basic Enlisted Submarine School at Groton, Connecticut. Following Submarine School, he attended Damage Control & Firefighting School in Newport, Rhode Island. Petty Officer Collins reported aboard his first ship, the Submarine Tender, USS CANOPUS (AS-34) on Christmas eve, 1972. Onboard CANOPUS for only three months, the Fleet Ballistic Missile Submarine, USS JOHN C. CALHOUN (SSBN630), had an urgent need to fill a billet due to an unexpected personnel loss. Petty Officer Collins volunteered to be the replacement and in March 1973, he joined the CALHOUN as a member of the Blue crew. Here, as a Navigation Aids Electronics Technician, he qualified in submarines, earning the coveted Silver Dolphins! He also qualified and stood watches as Navigation Supervisor, Radio watch, Sonar watch, Quartermaster of the watch, and in Below Decks watch. He made seven strategic deterrent patrols on the CALHOUN. 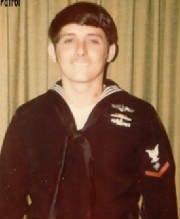 Petty Officer Second Class Collins left the CALHOUN in October of 1976, and reported to recruiting duty in New Albany, Indiana. Here he served as Recruiter-in-Charge of two recruiting stations. During this tour he married Marylyn Robison in October of 1978. During his off-duty hours, he began his academic career by attending evening and weekend college classes. He was also advanced to Petty Officer First Class in November 1976 after only 5 1/2 years of active duty. In November 1979, he transferred to USS COMPASS ISLAND (AG-153) in Charleston, South Carolina. The CI was a submarine navigation research surface ship that prototyped state of the art, experimental navigation equipment. Much of this technology and equipment is in use on the submarines of today. In May of 1980, COMPASS ISLAND was decommissioned and Petty Officer Collins was assigned as a plankowner to the pre-commissioning unit for the Fleet Ballistic Submarine Navigation Test Unit which ultimately was to embark in USNS VANGUARD. During this period, Petty Officer Collins again attended college in his off duty hours, earning enough credits to complete his Bachelors degree. He then applied, and was accepted, to Officer Candidate School (OCS) in Newport, Rhode Island, as a Supply Corps Officer. Graduating OCS with honors as the Seamanship Award winner in March 1981, Ensign Collins attended the Navy Supply Corps School in Athens, Georgia. Graduating second in his class of 103 in November 1981, he selected his first assignment to the Combat Stores Ship, USS CONCORD (AFS-5). He served as Disbursing Officer, Sales Officer, Food Services Officer, and Assistant Stock Control Officer. During this tour, CONCORD provided support to the embassy in Beirut Lebanon before and after the terrorist attack on the Marine Barracks in October 1983. In April 1984, Lieutenant Junior Grade Collins was ordered to FLEET COMPOSITE SQUARDRON SIX (VC-6) at NAS Norfolk where he served as the Material Officer; providing financial, logistics, and repair part support to the squadron’s aerial and surface remotely piloted vehicles (RPV’s). He was promoted to Lieutenant in August 1984. 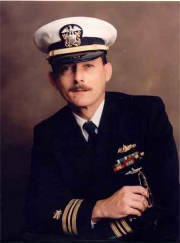 In May 1986, Lieutenant Collins reported to USS THOMAS C. HART (FF-1092) as Supply Officer and Supply Department Head. HART completed two very successful Mediterranean deployments that included NATO exercises. Lieutenant Collins also completed warfare qualification as a Supply Corps Surface Warfare Officer (SWSCO) during this tour. In April 1989 he transferred to Commander-in-Chief, U.S. Atlantic Fleet (CINCLANTFLT). Here, as the Afloat Supply Policy and Operations Officer, Lieutenant Collins worked directly for the two star Admiral who served as Fleet Supply Officer. He was promoted to Lieutenant Commander in September 1991. Completing nearly 22 years of active service, Lieutenant Commander Collins retired in April 1993. He has been awarded the Meritorious Service Medal, Navy Commendation Medal, Navy Achievement Medal (two awards), Meritorious Unit Commendation, Navy Good Conduct Medal (two awards), Navy Expeditionary Medal, National Defense Service Medal (two awards), Sea Service Deployment Award (five awards), Navy Meritorious Unit Commendation, Navy Pistol Sharpshooter Ribbon, and the Navy Recruiting ribbon. He has served the USS John C. Calhoun (SSBN630) Veterans Association as Vice President (2002-2004), President (2004-2006), and is the current Webmaster and Chairman of the board for the Association. He is the founder and current President of the USS Thomas C. Hart (DE/FF-1092) Veterans Association. Garry and Marylyn now have two grown daughters and three granddaughters. The Collins’s reside in New Albany, Indiana.